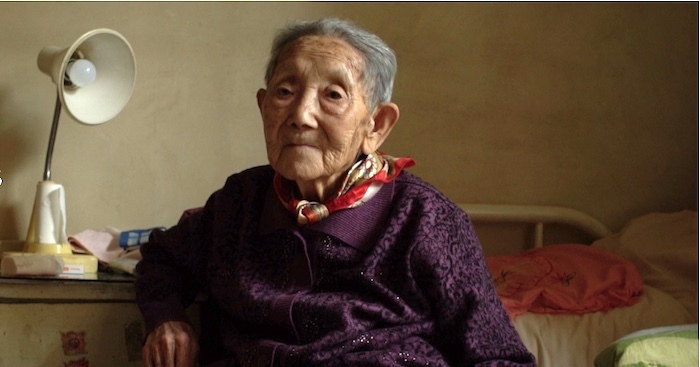 Wang Bing’s documentary Dead Souls tells the story of China’s deadly re-education camps. UPDATE: After watching the first half of this documentary I can say that it did not seem long at all, and it certainly was not boring. A long story, with many victims, takes a long time to tell. RIDM is presenting Dead Souls in two parts, over two days, Saturday Nov. 17 and Sunday Nov. 18, 2018. Each part is 250 minutes long. A ticket for Saturday’s screening is good for Sunday’s as well. Dead Souls has a 100% Fresh rating on Rotten Tomatoes. You can read 13 favourable reviews there. I will watch this on Saturday and report back. I imagine that one COULD watch Part 2 without seeing Part 1. Nov. 17, 2018 6:30 p.m.
Nov. 18, 2018 6:00 p.m.
Livestreaming celebrity Shen Man in a scene from the documentary film The People’s Republic of Desire. Yes, Fantasia shows documentaries, too! The People’s Republic of Desire is a fascinating (and sad, disturbing and depressing) introduction to China’s livestreaming celebrities. Some people from very humble beginnings have become rich and famous because they are very good at cajoling, begging, browbeating their fans into sending them gifts and money, lots of money. The People’s Republic of Desire concentrates on “comedian” Big Li, “singer” Shen Man, their families and their fans. I use quotes above because we don’t hear many of Li’s jokes or Shen’s songs. Her voice sounds OK, but director Hao Wu shows us what I think is a vocoder – is that the audio equivalent of plastic surgery? Shen admits that she has had plenty of surgery, too. On the other hand, Big Li is fat and not handsome, either, but that didn’t prevent him from becoming popular. His wife is his manager which puts a strain on their marriage. He sometimes rebels against her like a kid who doesn’t want to get up or eat his vegetables. He is also under pressure to join a big management company. Yes, there is lots of competition to manage the celebrities and take a cut of their earnings. Shen Man has pressures of her own – she is the sole support of her father, stepmother and younger siblings. And who bought that furniture, anyway? It’s really quétaine, as we say here in Quebec. In the Q&A director Hao Wu explains that he had intended to follow the stars for just one year, but that turned into three. An annual competition for most popular celebrity provides a natural focus. Shen Man has won it, ands wants to stay on top. Big Li has lost several times and wonders if he should keep fighting or just give it all up. The awards show for the competition looks just as glitzy as Hollywood’s Oscars and Golden Globes. Maybe it has a large audience, too. The graphics in The People’s Republic of Desire are superlative, immersive and very busy! The film has won many awards already and will probably continue to do so. See it if you can! Hao Wu will be at the Fantasia screening to answer questions. The People’s Republic of Desire, Friday, July 20, 2018, 1:00 PM, Salle J.A. De Sève, 1400 de Maisonneuve W.
P.S. When I read the synopsis of The People’s Republic of Desire I thought that it might be a bit like the film Dragonfly Eyes, shown here in Montreal at the 2017 edition of the RIDM documentary festival. It isn’t really, though the main character does become an Internet celebrity near the end. Dragonfly Eyes has mixed reviews on Rotten Tomatoes, but I thought it was worth watching. RIDM 2017 Review: Don’t Miss Dragonfly Eyes! 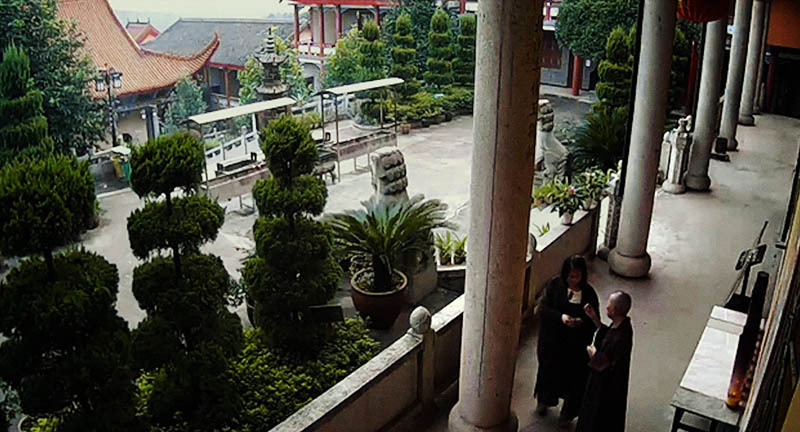 In the Chinese docu-fiction Dragonfly Eyes, Qing Ting, a woman who has spent several years living in a Buddhist monastery decides that she must leave. Dragonfly Eyes is one of my favourite films of RIDM 2017. It’s inventive, fascinating and more than a little disturbing. Qing Ting (Dragonfly) has spent the last few years living in a monastery. She was sent there for its calming effects, and considered becoming a nun, but changes are in the offing at the monastery and she does not feel comfortable there anymore. She goes to the city and takes a job at a dairy farm. (Sounds weird when you think about it, that’s not a calm place, either. Are there dairy farms in cities? It seems so!) The work is hard, it doesn’t pay much, the bosses are disrespectful and the cows and workers are under constant camera surveillance. The people who watch the screens are watched as well. 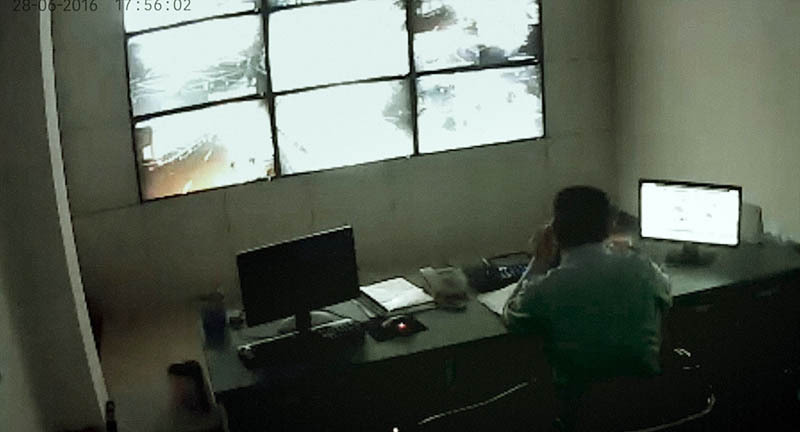 Everyone and everything seems to be under surveillance in the Chinese docu-fiction Dragonfly Eyes. At the farm, Qing Ting is noticed by the technician Ke Fan, and they start spending time together, visiting restaurants, and driving out into the countryside. Soon he is calling himself her boyfriend, even though she doesn’t seem to want one. Ke Fan does things that he thinks will please her, again without asking if that’s what she really wants. He’s quite violent, though not towards her. After assorted incidents that I won’t spoil here, Qing Ting loses her job at the dairy. She is insulted in her search for a new job and insulted some more once she gets one. Ke Fan is sent to jail for several years, and starts looking for Qing Ting as soon as he gets out. It’s not easy, because she does not want to be found. What do I mean by disturbing? 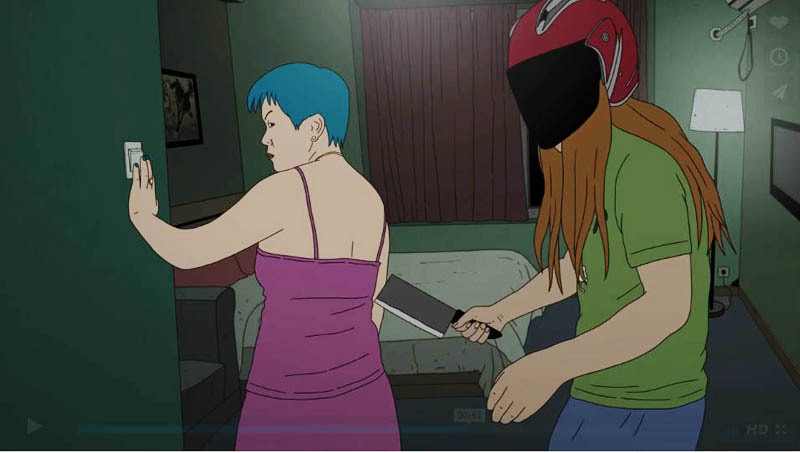 Ke Fan’s violence, other violent instances we see, celebrity culture, an obsession with money and appearances, and all that surveillance video. In many places I couldn’t help but think, why would anyone need to watch or tape those places, or this activity? Director Xu Bing collected hundreds of hours of video from the Internet to make the film. In many instances, the people who installed the cameras had not changed default passwords and other default settings, and they probably did not even know that they were broadcasting to the Internet. Dragonfly Eyes, 81 minutes long, in Mandarin with French subtitles, at Cinémathèque Québécoise, Salle Principale, 335 de Maisonneuve Blvd E.
RIDM (Rencontres internationales du documentaire de Montréal) runs until Sunday, Nov. 19, 2017. Visit the RIDM web site at RIDM.ca for more information. 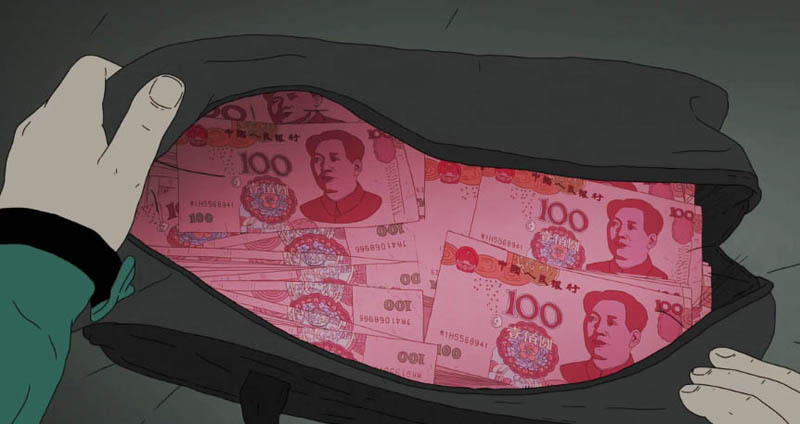 A stupid guy steals one million yuan from his boss in the Chinese animated neo-noir Have a Nice Day. 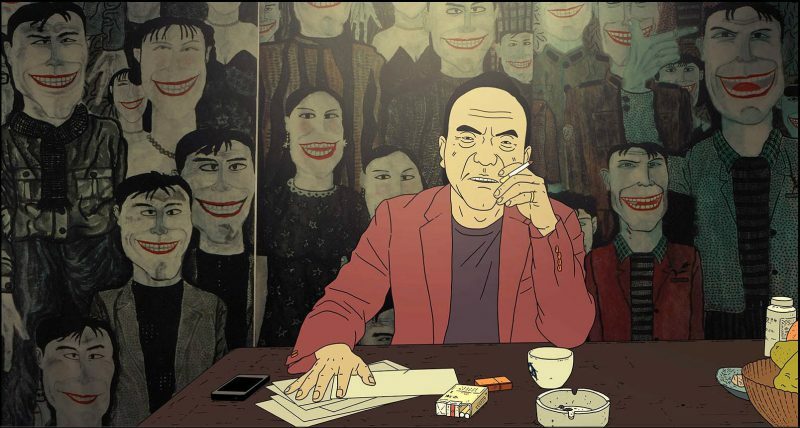 Have A Nice Day (Hao Ji Le) is a very clever, animated neo-noir film from China. I don’t remember seeing such a thing before. You? The character Xiao Zhang, on the other hand, is not clever at all. In fact, he’s dumber than the proverbial sack of hammers. As a fan of movies like The Godfather, he ought to know that stealing from your sadistic, criminal boss, is a very bad idea. Mistake No. 2 was taking the bag full of money (100 million yuan = $187,090.52 Canadian) from a fellow employee at knifepoint, so there’s no mystery about who the culprit is. Maybe he could have gotten away with this for a short time, but the idiot doesn’t even leave town! And he isn’t any good at covering his physical tracks, nor his digital ones. The crime boss, Uncle Liu, sends his henchman Skinny, who is also a butcher (gulp!) after Xiao Zhang. Of course, once other people hear about the stolen money, they go looking for him, too. He draws attention to himself by using a large bill to pay for a cheap meal. His rudeness towards a guy at an Internet cafe leads the man’s friends to beat up Xiao Zhang and take the bag. That bag passes through many hands, rooms and vehicles in the course of Have A Nice Day. This is Uncle Liu, the baddest bad guy in Chinese animated film Have a Nice Day. Would you mess with this man? BTW: There’s no question that Uncle Liu is sadistic – early on we see that he’s holding a hostage – a half-naked, bruised and bloodied man who’s tied to a chair. When Uncle Liu tells an embarrassing anecdote about him we realize that they’ve known each other since childhood, though we never do find out exactly why the man is tied to a chair. In old U.S. films, a guy might do a stupid or dangerous thing (robbery, kidnapping or a boxing match) because a sick mother, brother or sister needs surgery to prevent blindness, replace a failing kidney, etc. But Xiao Zhang has stolen the money because his his fiancée’s plastic surgery did not go well. He wants to take her to South Korea to get the job done right. He must make her happy, so they can marry, have children and make his mother happy. Filial piety is still a thing! These are just two of the many people chasing after stolen money in the Chinese neo-noir animation Have a Nice Day. 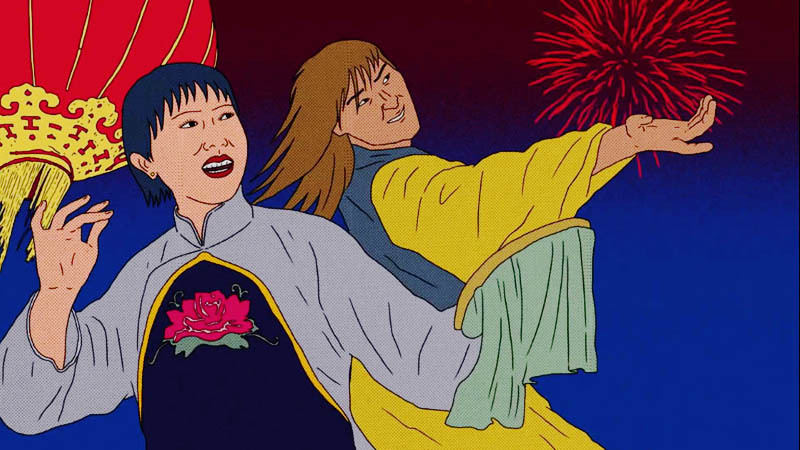 Philosophical remarks about the different levels of freedom, and an animated music video that mocks the iconography of Chairman Mao’s era are among the many things that make Have A Nice Day entertaining. We are so very far from that era now. People dye their hair all sorts of colours, including blue; they wear U.S. T-shirts; they have U.S. film posters on their walls, they struggle to send their children to university in the U.S. or U.K., they talk about Steve Jobs, Bill Gates, Mark Zuckerberg and Brexit. We even hear a few words from Donald Trump on the radio! Some practice Christianity, while others just wear crosses as a fashion statement. I didn’t see anyone riding a bicycle, either! The Chinese animated film Have a Nice Day contains a music video mocking the iconography from the era of Chairman Mao. Director Liu Jian also wrote the film and his name appears in several other places in the credits, too. Seems like a multi-talented guy! And I wonder if he jokingly named the villainous crime boss after himself? Have A Nice Day was shown in competition at the Berlin Film Festival earlier this year. Variety says that Strand Releasing has bought the distribution rights for the U.S. and the company plans to show the film there in the fall. Memento Films International has sold distribution rights for Have A Nice Day in the U.K., Spain, Benelux, Switzerland, Greece, Turkey and Eastern Europe. Meanwhile, lucky Montrealers can see it on Wednesday, July 19, at 3:15 p.m., in Salle J.A. De Sève of Concordia University, 1400 de Maisonneuve Blvd. W., as part of the Fantasia International Film Festival. The Chinese film Free and Easy has two screenings at the Fantasia International Film Festival in Montreal. The film won the World Cinema Dramatic Special Jury Award for Cinematic Vision at the Sundance Film Festival. 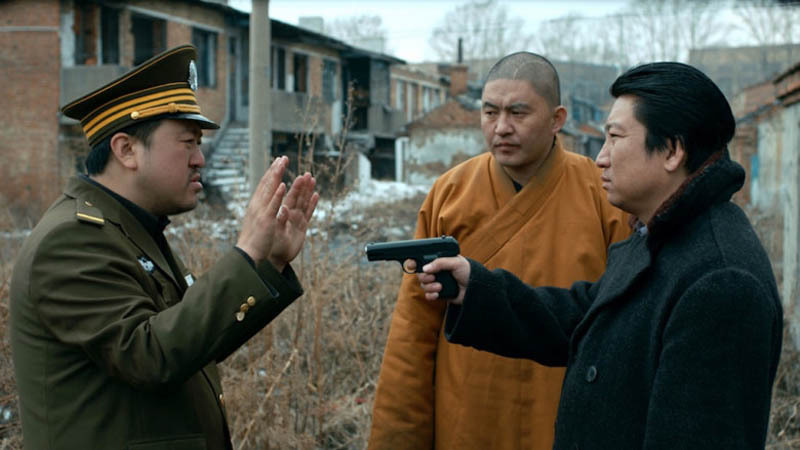 Free and Easy is low-key, black comedy that takes place in an unnamed Chinese town in winter. Many of the town’s buildings have fallen down, while others are in an advanced state of disrepair. There’s some symmetry in Free and Easy: two con men, two policemen, two guys pasting posters on walls. Eventually we see a con woman, too, and a third person pasting posters. One con man asks people to smell the soap he’s selling. Something in it quickly renders them unconscious. He takes their money, phones and watches while they’re knocked out. Pretty easy as far as it goes, but the pickings can’t be great in such a rundown place. There aren’t many people out and about, either, though it’s not clear if they’re sticking close to home or if the town is more or less abandoned. If there were more people around, surely they’d warn each other about this guy. The other con man is an alleged monk who offers “free” amulets, but then requests a “donation,” to rebuild his burnt-out temple. If they don’t want an amulet, people can touch him “for luck.” Of course, he wants money for that, too. When the monk and the soap man walk along some railroad tracks, there are ugly grey hills in the distance, the kind of scenery we see in films by Jia Zhang-ke. Is this place a former mining town? As for the poster-pasters, one is looking for his mother, who has been missing for years, while the other is looking for a very large tree, which vanished more recently. The policemen don’t seem to have much to do; they smoke and eat in the station house, even sharing their medications in a weird, comradely way. One of them has plenty of time to make unwelcome visits to a woman who runs a boarding house. Coincidentally, the soap man rents a room from her, and her husband, who’s in charge of a reforestation project, is the man looking for the missing tree. This tree man is a very quiet sort. Slow moving, too. He might be bored out of his. . .tree, exhausted, or suffering from narcolepsy, who knows? The jokes in Free and Easy are subtle; there aren’t any martial-arts battles, or car chases (hardly any cars at all, actually). There is a troublesome dead body that has to be dealt with, though. Free and Easy won the World Cinema Dramatic Special Jury Award for Cinematic Vision at the Sundance Film Festival. Music in the film is from Chinese band Second Hand Rose. Second Hand Rose has a web site, and a Facebook page. The New Yorker wrote a profile on the group back in 2014. Free and Easy will be shown on Thursday, July 20, 2017, at 5:30 p.m. in Salle J.A. De Sève of Concordia University, 1400 de Maisonneuve Blvd. W., as part of the Fantasia International Film Festival. 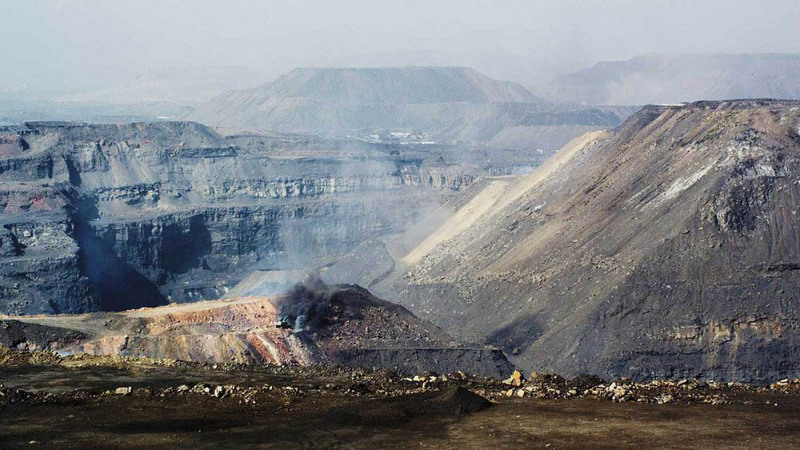 Zhao Liang’s documentary film Behemoth shows how parts of Inner Mongolia have been destroyed by coal mining. RIDM, Montreal’s documentary film festival, takes place in November, but festival organizers keep the doc spirit alive throughout the year with monthly screenings at Cinema du Parc. The selection for Thursday, May 26, 2016, is the Chinese film Behemoth, from director Zhao Liang. 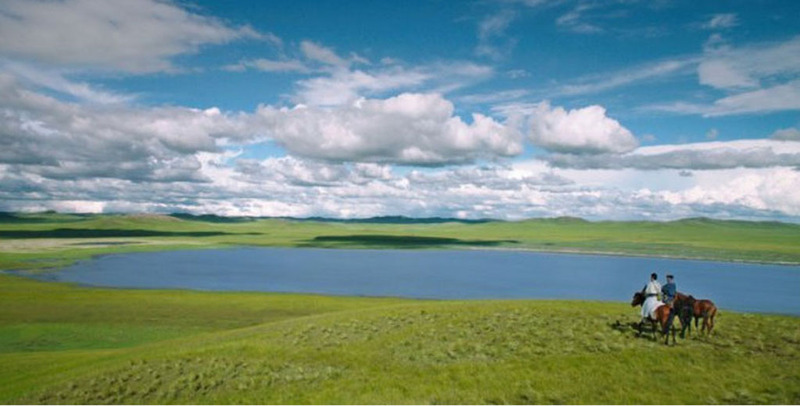 Behemoth looks at the human and environmental devastation created by coal mining in Inner Mongolia. The landscape is scarred and ugly, while the men have blackened faces and hands. Imagine what their lungs must look like. We don’t see any chest X-rays in the trailer, but we do see them cough and struggle for breath. We see some hooked up to oxygen tanks, too. 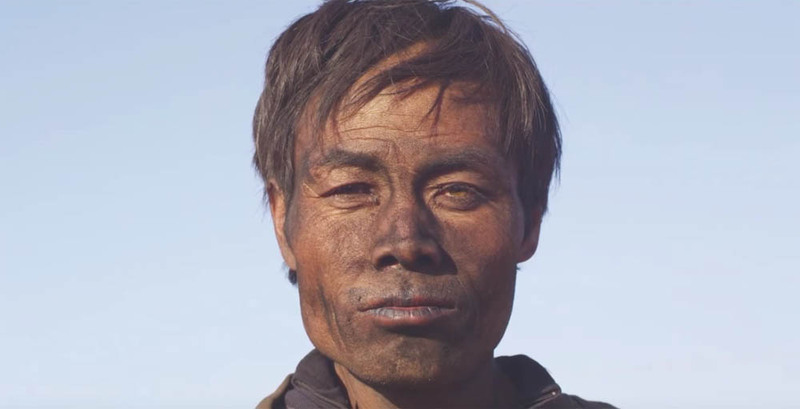 The sooty face of a coal miner in Zhao Liang’s documentary film Behemoth. That coal powers smoky, noisy, iron foundries and steel plants that glow with red-hot heat like a vision of hell. In fact, Zhao Liang took inspiration from Dante Alighieri’s Divine Comedy, which sees the Florentine poet travel to Hell, Purgatory, and Paradise. Behemoth uses excerpts from the poem in place of dialogue. Foundry employees work with molten metal in Zhao Liang’s documentary film Behemoth. I have read more than 10 reviews of Behemoth and they were all extremely enthusiastic. Here are quotes from a few of them. Thursday, May 26, 2016 at 8 p.m.
To avoid disappointment, consider buying your tickets online, here on Cinéma du Parc’s web site. In the Chinese film Wolf Totem, Chen Zhen (played by William Feng Shaofeng) adopts a wolf pup, against the wishes of his Mongolian mentor. Wolf Totem is a Chinese film with a Chinese cast, based on a Chinese book, shot by French director Jean-Jacques Annaud. The 2004 novel Wolf Totem was an international best-seller. It was translated into more than 30 langauges, sold millions of copies, and won the Man Asia Literary Prize in 2007. It was based on the experiences of author Lu Jiamin (writing under the pen name of Jiang Rong) who lived among the semi-nomadic herders of Inner Mongolia for 11 years, beginning in the late 1960s. He was one of the millions of students who were sent to the countryside during the Cultural Revolution. The landscapes in the Chinese film Wolf Totem are stunning. The author’s alter ego, Chen Zhen, learns a lot about the herders’ traditional way of life, and the fear, respect and admiration they have for the wolves who share the grasslands with them. Some of the book’s dialogue sounds more like one-sided lectures than true conversations; even so, it’s a fascinating read. Politicians living far, far away make cringe-inducing decisions of the “this-will-not-end-well” kind – to set up large farms, to encourage the immigration of Han Chinese, and to slaughter all the wolves. Chen Zhen (played by William Feng Shaofeng) develops a fascination with the wolves, and adopts a young pup, going against the wishes and advice of his Mongolian mentor, Bilig. While an official announcement hasn’t yet been made, several news articles say that Wolf Totem will be China’s entry in the race for an Academy Award. Wolf Totem has two Canadian connections. One is actor Shawn Dou, who plays Chen Zhen’s friend and colleague Yang Ke. He moved from China to Vancouver with his parents when he was 10 years old, and returned to China in 2008 to study acting. 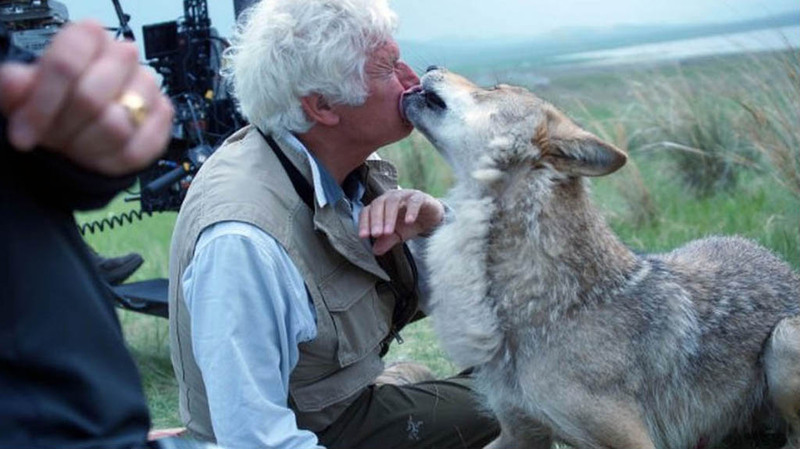 During the filming of Wolf Totem, a wolf named Cloudy became very fond of director Jean-Jacques Annaud. 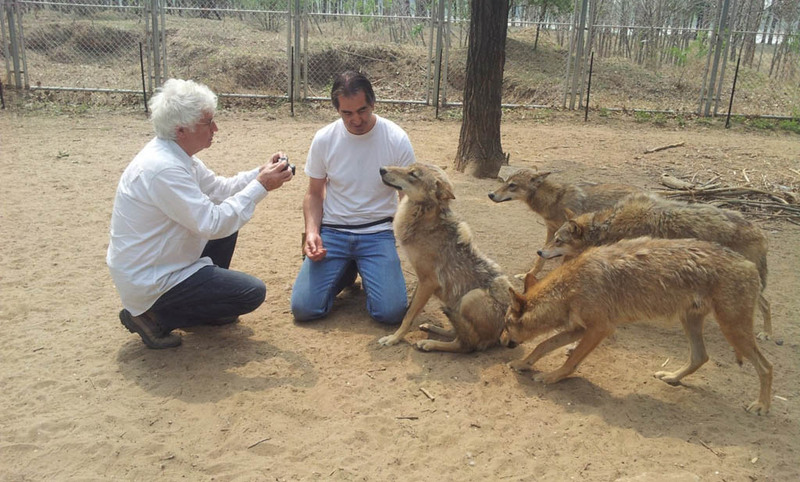 Director Jean-Jacques Annaud, left, and animal trainer Andrew Simpson with some of the trained wolves from the Chinese film Wolf Totem. Film production and Sales : Prod. : Max Wang, Xu Jianhai, China Film Co., Ltd. / Beijing Forbidden City Film Co., Ltd.
Festival des films du monde / Montreal World Film Festival continues until Sept. 7, 2015. Consult the festival’s web site for more information.